I didn’t meet income goals for 2017. Consequently, I need a second job. To accommodate the second job, I’m eliminating the intensive 9-day training. After May, I’ll just be teaching weekends and afternoons. This will work very well for most of the people who have approached me over the years, but I realize it’s a bummer for folks who were able to take a whole week off at a time. I recommend a program such as Aviator PPG‘s for those who can make it down there. I think immersion is superior to splitting training up over the whole summer. This was one of my goals for 2017, but it was delayed due to a thoracic injury last winter. Finally, in 2018 I’ll be available for Tandem Foot-Launch flight training. I’m still working on all the certification steps, but I expect to be operational by May. 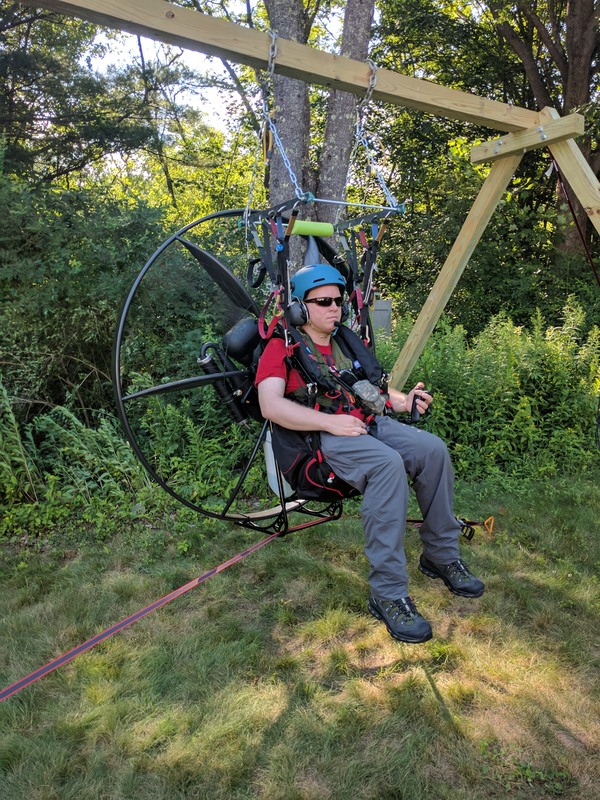 I’m really excited about this, as I’ll be able to show prospective pilots what flying a paramotor is like without the stress of them being the pilot-in-command for their maiden flight. We’ll be able to safely practice and practice things like Pitch and Roll oscillations– the gremlins of the sport. I’ll no longer be supplying school motors for training, at least not in 2018. When ground handling and towed/tandem flight training is complete, I’ll expect pilots to buy their own motor (and I am here to help you do that; whether you’re looking for a new motor or used). I’m going to miss teaching with school motors– I could always depend on them, and I always knew their batteries were charged, fuel was new, structure was intact, etc. It was an excellent value proposition for pilots who weren’t sure what motor they really wanted. However, I’m not going to miss maintaining a fleet of them, doing taxes on them, and storing and transporting them in my little car. 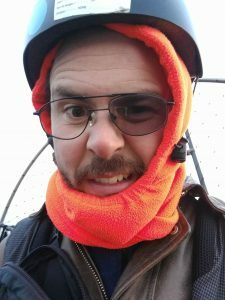 I will have some wings and harnesses for teaching the difficult parts of paramotoring (wing handling), and I plan to utilize tandem flight training in 2018, so students will have some idea of what flying is like without needing to buy a motor right away. I arrived in Bogotá Wednesday morning at 2am. I had a hostel bed booked for that night, but the receptionist left much earlier than I arrived. The night played out like a puzzle game (Myst, etc. ), which I entered a code into the front door, unlocked it, found a paper message hidden behind a sign on the front desk, found room 201, and snuck into an empty bed. I had perhaps 4 hours sleep. Later that afternoon, I boarded a plane to Pereira, close enough to Roldanillo to take a bus. I met up with a pilot friend from Romania (Ovidiu) and together we bused to Rolda. Scenery was familiar on the ride down. Bogotá was at 8660 feet of altitude, whereas Rolda and the Valle del Cauca were closer to 3000, so the temperature in this equatorial region was much hotter. We arrived around 6pm. My first night in Roldanillo was spent greeting friends from the flying community and locals I knew. Some pilots I had flown with 2 weeks earlier in Mexico. It’s a common rotation to fly Valle De Bravo (Mexico) before coming to Roldanillo later in the winter. The air in Valle De Bravo gets pretty strong in February and March. I had a few beers and a Patacón (Arepa with meat and cheese on top of it. very dense) for dinner. 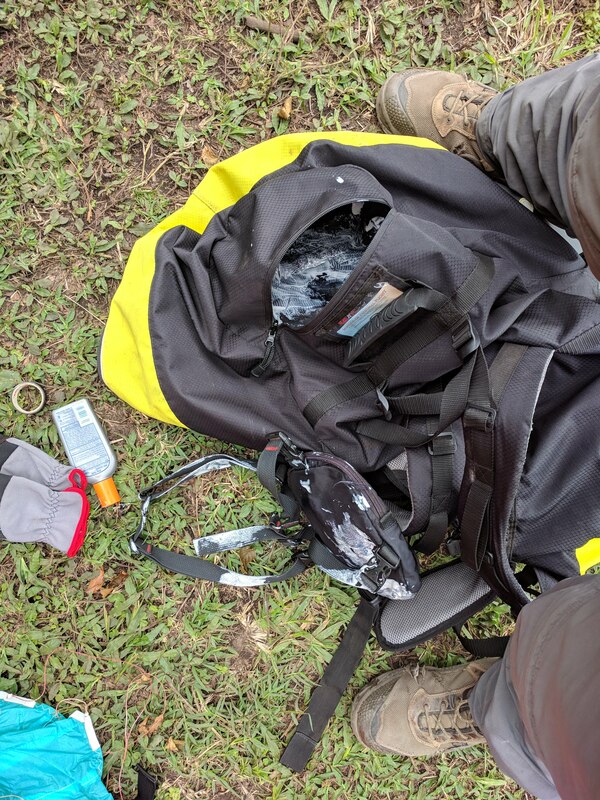 Sunscreen exploded inside my paraglider bag. I’ve been warned that this could happen for years. It finally happened. 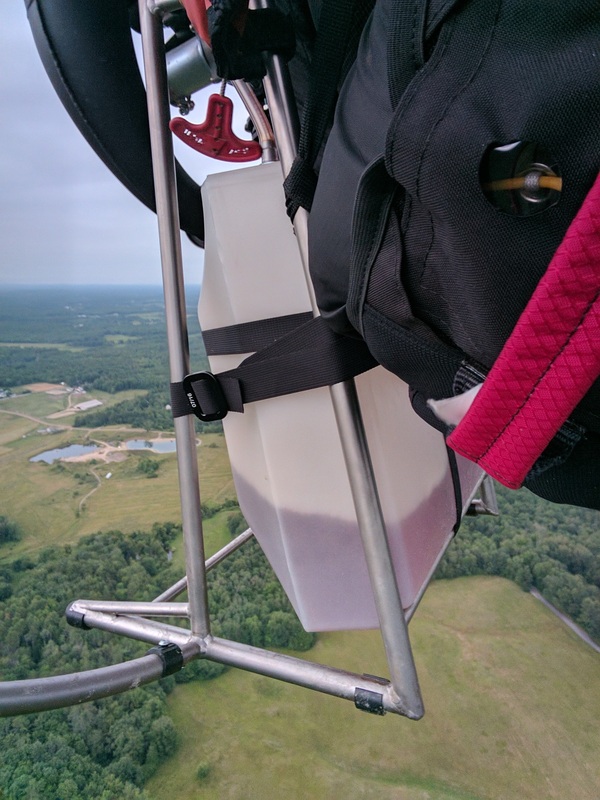 Thursday was my first flying day, and my first flight on my new wing, a red Advance Sigma 10. I bused up to Aguapanela and put my gear down in the back of launch. First observation: this used Sigma 10 (40 hrs) looked fresh and crispy! I really like how the left and right risers are labeled with colors (red-Left, blue-Right). Second observation: My sunscreen had exploded in the accessories compartment of my paraglider bag. I smeared the leftovers on my face and invited other pilots to take the free sunscreen; sunscreen is surprisingly expensive here. Before I could lay out my gear for launch, it started raining. lightly at first, but steady. I was worried that I might not get a flight at all, so seeing that it was sunny out in the valley, I launched toward dryer air. The rain felt much harder when I was flying through it at 25 mph (trim speed of this Sigma 10 is about the same as the Ozone Rush 4). The Shark Pod eating some of the weird fruit. They looked like miniature spherical watermelons growing on a bush. Indeed, the air was dryer, and thermals were popping above the town of Roldanillo. I got to cloud base and went XC north. After arriving at the town of La Union, I crossed the valley toward La Victoria. La Victoria is a pueblo in these scraggly mini-mountains in the middle of the valley. I got there high, but thermals were not working there yet (it wasn’t yet even noon!). In a last desperate attempt to stay flying, I flew over a dry, brown corn field with a farm in the corner. Dry corn both collects and traps solar heat– the brown leaves soak up radiation and the tall stalks keep the hot air in one place until something triggers it to leave. I was hoping the farm would trigger the thermals (machinery moving air down there, people and animals walking about). I got nothing. Landed on a small hill next to the farm. Part of my enjoyment of flying in Colombia is the walk out. It’s hot, yes, but I don’t mind it. I love seeing the variety of birds, the bulls with their weird camel-like back humps, and the weird fruit that grows everywhere. The people I have met in the past 3 years have been nothing but kind and helpful. Colombia is a friendly place. I let this blog post sit for a month before I decided to publish it. It’s not a call out, and nobody has done anything wrong that I know of; in fact, we’ve had a much better experience in Maine than in the rest of the country. I generally want to build enthusiasm for PPG, but it’s important to keep the enthusiasm shared by our neighbors, too. 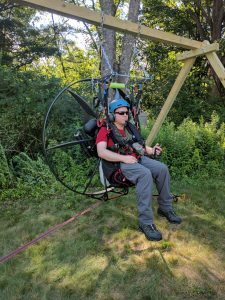 When I announced my intentions to ‘go big’ in PPG instruction a couple years ago, a respected friend in the industry told me something like, “One paramotor is a beautiful butterfly. Ten paramotors is a swarm of angry bees.” What he meant is that as the sport grows, its impact on the community scales to a different metric. 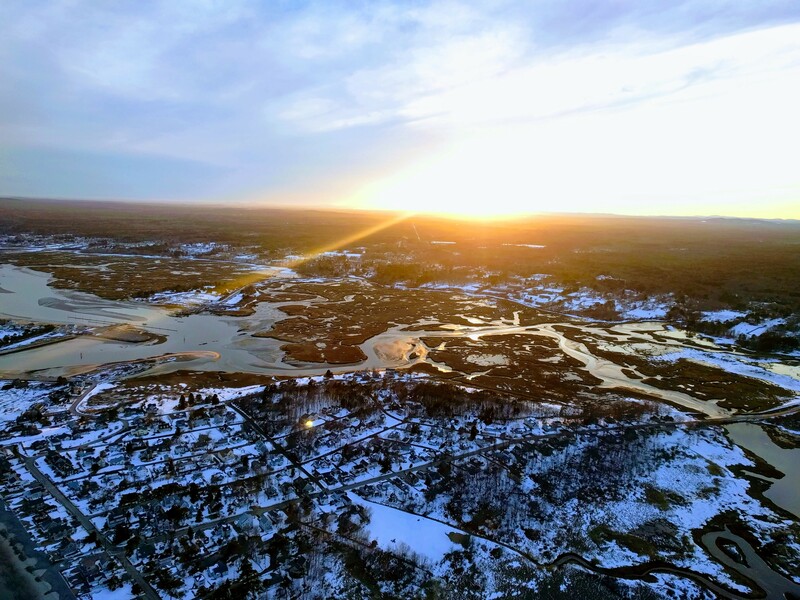 I’ve spent some time thinking about the endgame of training so many new pilots to fly in the New England region. It’s great that more of us are getting into PPG. It’s fun, and I love the adventures we have when we fly together. New motors and wings are flowing into the region’s schools, and a used-equipment market is forming under us, allowing pilots to get into the sport cheaper than ever before. Expertise and support is no longer on the other side of the country; it’s just down the road. LZs are opening up as pilots share their spots with friends. Maybe one day para-sports will enjoy a European level of popularity, or dare I forecast– a ski-industry level. But there are some pitfalls that could snag us on our way to becoming mainstream. If we fail to avoid them we may go the way of the drone– tightly regulated and controlled by the government. Of more immediate concern to me is our regional impact. Our pilot population has grown exponentially in New England, and we need to do our best to control our profile. We have lost access to launches before; it will likely happen again. If it happens quickly, the problem will snowball as more pilots are concentrated into fewer, sketchier launch sites. We hardly have any public land, so every LZ we use is by the graces of a private citizen who doesn’t want to regret their generosity! Our profile consists of several factors: Noise, Visibility, and Information. Objectively, we are not very loud when compared to all other powered aircraft. However, we are slow; consequently, we expose observers to a level of noise for a longer time. Flying high (>500 feet) and flying below tree lines and mountain ridges attenuates our observable noise (but don’t fly in rotor). Flying low is pretty noisy to people on the ground. If there are people on the ground, don’t fly circles in that area. If another pilot has already circled near the ground, avoid the area and maybe play low in the next open area along your route. Flying with a constant RPM is preferable to flying like a revving chainsaw. If you like to throw down and rev it up, at least transition to and from your acro-arena with a constant cruise RPM. When coming in to land, decrease your RPM before you are within earshot of the LZ. I like to idle my motor miles out, and kill it once I know for sure I’m making the LZ. It’s good practice for motor-out days, and it’s rewarding to nail a spot-landing from a mile away. As any pilot who has flown the coast can attest, tourists love to take photos of this weird flying thing they saw. Some of us got into the sport after having a similar encounter, and to many people, this experience makes their day! But consider that a person who is photographing the 10th PPG they’ve seen flying around them that day might be seething mad and want some evidence of the thing that ruined their morning walk. Don’t get me wrong– most of the people around here have been supportive and excited to see us. But, as it has happened to several friends, you might get a scolding by a stranger because they think you are the same aircraft (real or imagined) that has been terrorizing them for years. Don’t give them ammunition. 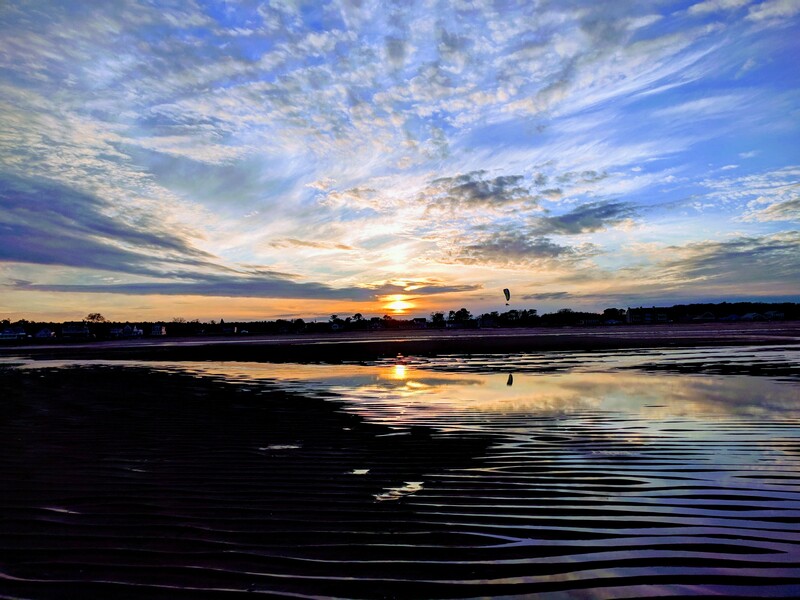 Over Hills Beach, Biddeford. The tide was way out, and few people were on the beach in the 38ºF weather. Four of us carved up the air and the sand to our hearts’ content. Information takes the form of news articles, internet posts, and videos. 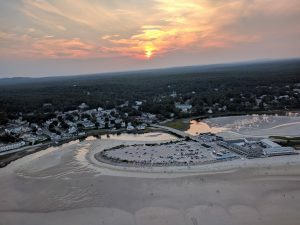 I had a saying for a long time, “Don’t make the News.” I don’t say that anymore because one local pilot made the news in a good way, raising money for charity. But generally, you make the news if the police pick you up, you land in someone’s hedges, or if you hit a power line. As for internet posts and videos: share publicly your cool experiences, your beautiful flights, your adventure stories (even if it involves crunchy metal). Don’t share FAR 103 violations (like cloud flying and flying near people), and don’t share anything that could be interpreted as chasing animals and people. If a less experienced observer might interpret your photo/video as a violation, you should include a mitigating disclaimer. For example, if you made a video of a Bald Eagle flying alongside you, explain that you didn’t seek it out; it found you. If you are flying near clouds, describe the airspace rules that you’re following which allow you to fly near them (e.g., in Class G you can be just “clear of clouds,” not a specific distance from them. Or maybe your video is from another country that doesn’t follow the same laws as your audience). When you create information, ask yourself how it can be used against you. If this all sounds sickeningly paranoid, you’re right. We walk on eggshells because sometimes we have line-of-sight to a thousand people. Our sport isn’t yet well understood by the public; and people still call 911 when you nail a perfect landing. We have to keep in the public’s good graces, but at the same time, flying isn’t worth doing if it isn’t fun. We’re going to slip up sometimes, and we’re probably going to lose sites. Recognize that if you’re the pilot on launch who is informed that we can no longer fly a site, it’s not all your fault— it’s the pressure of our sport on the community. 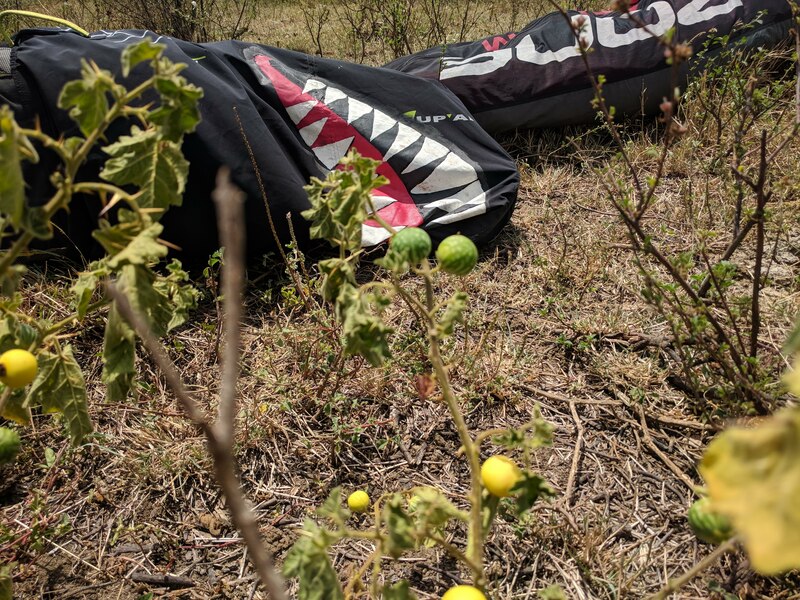 It’s covered in the USPPA best practices [in much less crass terms], but it bears repeating: minimize your impact on your rare and treasured Launch/LZ spots by not loitering over them. 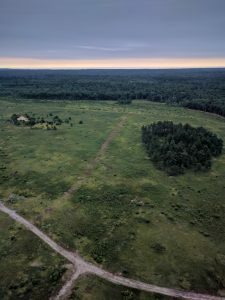 Often if you’re surrounded by farmlands, there are other fields you can play over– out of earshot of the VIP landowners that gave you permission to fly. If you land out anywhere in Southern Maine, call me and I’ll come pick you up; the weirder the spot, the better. I like adventures. Consider this recent memorandum from the USPPA. It contains best practices for flying that aim to preserve our sport. Take them to heart. While we provide what we believe to be a fantastic value for a very nominal cost, we also understand that not every pilot will be a member of our organization. Still, we have a profound interest in the long-term viability of paramotoring in the United States. We find ourselves at an interesting crossroads where we have a vastly increased visibility due to a large number of new pilots. This is quite welcome in general but we do have to reckon with our increased impact as time goes on. We create more noise pollution, we are subject to the increased likelihood of conflict with other aircraft, and we have far more integration with landowners of all kinds. We would like to hereby thank you in advance for considering all of these ideas and would like to ask you for the huge favor of sharing this information with your peers. 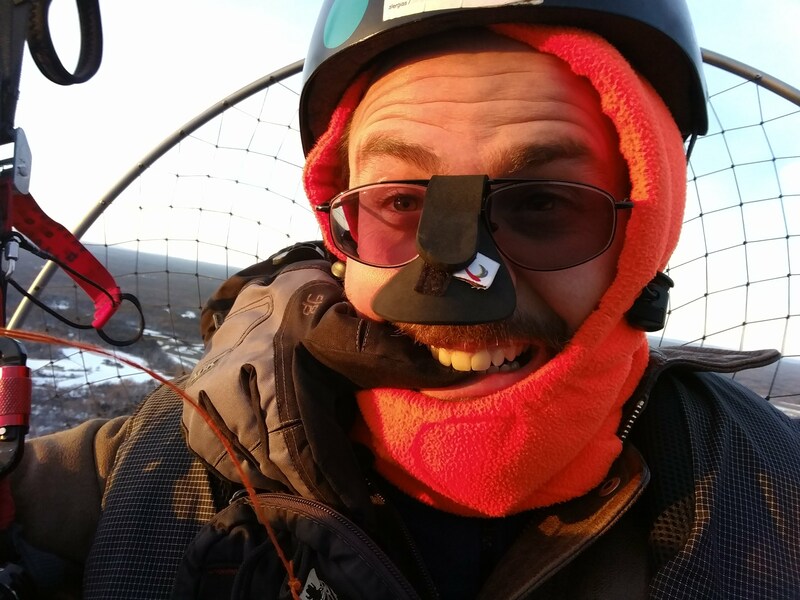 Please forward it via email, print it out, share it via social media and please know that by embracing these ideas you can work to ensure the long-term viability of paramotoring. Please consider the subtle difference between the experience where you spot something like a bald eagle and then it subsequently flies away leaving you with a sense of mystery about where it came from and where is going. On the other hand please consider how annoying it can be when you have a fly that is buzzing around inside your car. Let’s aim to be the former. I’m currently in Mexico. I’ve been here 3 weeks with my family, and now, with my friends. I have participated in one paragliding competition, which ended yesterday. I did not crush it, but I had some great, fun flights. Today I’m taking a break from flying, as I’ve been doing 3-5 hour triangle XC flights for the past week. It’s also time to do my Sales Taxes, so I needed a day on the ground. I get back to the US Jan. 22. I’ll be around to ship parts, help with motors/wings/kiting, and maybe I’ll even get in a flight if it’s warm. I’ll be honest though– I’m adapting to the daily 85ºF here. I leave for Colombia in February for more competitions, and lots of XC flying. There should be a good contingent of Maine pilots down there this year, so let me know if you want to come! I’ll be in Roldanillo for the 2nd and 3rd weeks of February, then I’m open to travelling around after that. Ok, gotta go– time to demo a new wing! It’s October [edit: Actually November now– I really slacked off on blogging this fall] in New England, and the leaves are changing color. Days are getting noticeably shorter, sometimes almost 3 minutes shorter per day! The Northwest wind is blowing from the Canadian shield, bringing with it colder temperatures and high winds aloft. What’s a pilot to do? It’s flyable, but not as often as it was in the summer. If you can stand the cold, and your wing is fast enough, you can fly some winter days. The days are are shorter though, so with the sun setting before the workday ends, you may find yourself limited to only weekend flying. A strobe light is a helpful piece of equipment to have. Per FAR 103, if you wear a strobe light that is visible for 3 miles in all directions, you can fly up to 30 minutes before sunrise and 30 minutes after sunset, which might make the difference between driving home after work or flying for a few sweet (cold!) minutes. Just in time for winter 2017-2018, I started importing the brightest strobe lights I could find that still held up to the vibration of our motors. I have a long history with strobe lights, but that’s a story for another post. See my HsCOM STR1 Strobe Lights if you want that extra hour of flying time per day. In the winter months, the Jet Stream descends from its summer home around the North Pole to cripple flying in the Northeast. OK, so that’s anthropomorphizing the weather a bit , but basically, we have the polar vortex to blame for our speedy winds. Today for example, as I write this, winds are 59mph at 3000 feet. Generally whatever is happening at 3000 feet is happening almost as fast just about the trees; What’s to stop it? Fortunately, the Jet Stream, like all air and water currents, snakes back and forth– sometimes whipping us, and sometimes giving us a break from the breeze. How do I stay warm? With your hands high above your heart and thrust out into the fast-moving air sucking past your propeller, your hands WILL be the thing that will make you want to land (and maybe cry a little). Gloves are a must. Some of us launch while wearing gloves, but beware that it may be hard to hit your kill switch with thick, soft gloves. Also, you won’t be able to feel the lines and brakes quite as well as you could with no gloves. You can launch without gloves, climb to altitude, and put them on in the air. As a middle ground, try buying gloves that come with removable liners. You can launch with the liners on your hands (giving you some protection from the cold) then put the outer gloves on in flight. Many of us fly with heated gloves. I don’t personally wear them, but that’s because I’m a bit of a weight snob, and my machismo doesn’t allow me to wear warm clothes in the winter. I’m working on that personal issue, as it’s clear that heated gloves are the way to go. Those pilots who wear heated gloves swear they are incredibly comfortable, and make all the difference for winter flying. Don’t leave them on and heated for too long on the ground– sweaty hands are miserable if they get cold again! I’ve tried heatpacks. On moderately cold days (above freezing), they seem to work. On really cold days, hand heatpacks aren’t adequate. I use foot heatpacks in my gloves, but they just create a hot spot on my hands, and my fingers still freeze. Heatpacks in your boots are recommended, though. With it being cold, there’ll be no thermals, right? Not so, I’m afraid. You’ll still want to avoid flying midday most days if you want to avoid thermals. It is indeed still possible to thermal in the winter, as thermals are pumped by differences in temperature. Thermals aren’t causing most of that turbulence, though. If it’s windy out, that wind is spilling over the terrain, trees and buildings. 15mph wind causes rotor turbulence during the summer, but when the wind just about the trees is approaching 30mph on an otherwise warm winter day, you can expect the turbulence to be 4 times stronger. Sometimes though, wind is much faster than that for days, and it should be pretty obvious that you shouldn’t be flying a craft that only flies around 25mph. 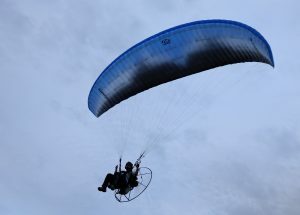 I get asked about paramotor thermalling very often. I love both motoring and thermalling, but I rarely combine the sports. I’ll admit I love thermalling free-flight more than motoring, and I feel the motor dampens the sensations I’m accustomed to in my free-flight harness. Nevertheless, it can be done, if you’re into that sort of thing. Paragliders are designed to fly in thermals. Beginner wings are more stable and more likely to recover on their own. Advanced wings have a complicated outcome, and can get out of control really, really fast. 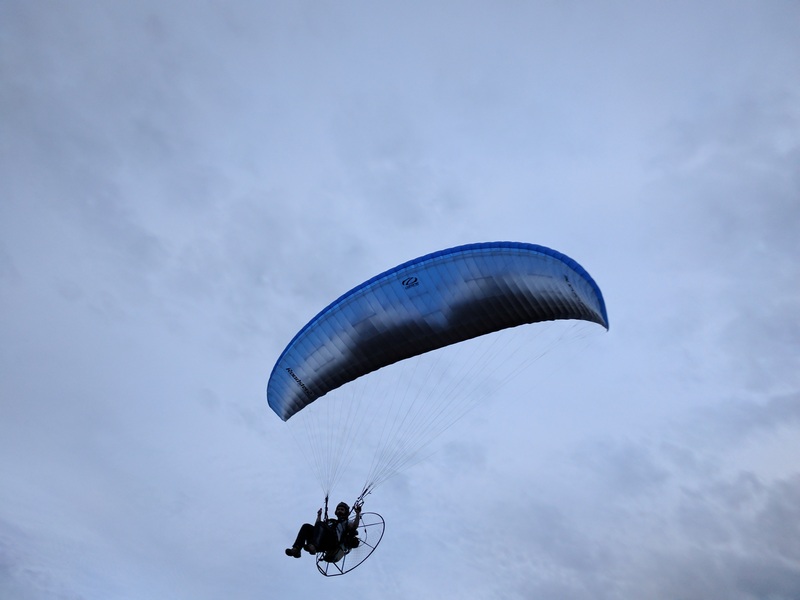 For that reason, a pilot who motors a hot paramotor wing at 55mph might fly a slower, docile, EN-A or -B wing in thermals. What extra equipment do you need? Variometer (App or Instrument). Turn the volume up all the way so you can hear it beep over the wind noise of your paramotor frame. Some extra safety equipment– beyond your standard kit, which around here, should include a hook knife and flotation. Reserve. Definitely carry a reserve and rehearse using it. How do you prepare for this undertaking? Accept the risk. Risk is increased due to turbulence when entering and exiting thermals, and potentially due to rotor near the ground as the wind picks up throughout the day. You are forfeiting the safety that was inherent in flying the non-thermic mornings and evenings. Get lots of practice flying in bumpy air. I got mine through my paragliding career, where I flew in turbulent air most of the time. If all you have is a motor, rack up lots of hours flying your wing in air a little bit bumpier than you usually tolerate. Stay high. You need to be comfortable and calm when the air tosses you around– and it will, especially at first. SIV (Simulation d’Incident en Vol). These are courses usually taught over water with a rescue boat. You are guided through a series of self-inflicted inflight maladies, and then guided through their solution. Attending one is highly recommended, especially if you can practice in your motor. For most people it builds confidence. For all, it builds familiarity with the wing. If you thermal long enough, you will eventually see something that resembles an SIV maneuver, and you’ll know how your wing respond to it, and how you should respond to your wing. In this post I’m just describing the extra considerations required to fly midday. Don’t take any of this information as instruction– Midday flying is really ramping up the risk, and flying without significant weather experience is foolhardy at best. It’s been a while since my last update. I’ve been really busy, which is great! I had a couple of new students in July/August. J needed some touch-up training and help with Airspace and FAR 103, as well as transitional training on the Trike. He progressed quickly and his launches were excellent after just a few flights. Robbie assembled his new Scout Carbon and joined the ranks of the flying (had his first flight) at the end of July. His launches and landings have been great so far, and he was landing on his feet from the first flights, which keeps that sleek Scout motor clean. Robbie breaking-in his Scout Carbon Moster 185. This is one thoughtfully designed machine. I really like the Safe-Start mechanism– It works! I have to give a huge thumbs up to Miniplane-USA for servicing a motor that was giving a local pilot trouble. Miniplane and Minari stood behind their product 200% and replaced a defective unit. You’ve made a pilot very happy! Chris enjoying his new Miniplane Minari 180. We had some beautiful late summer flights, including some pretty long excursions and triangular flights paths. When the summer winds down, the air calms down a bit. As I write this, we’re in a 3-day-streak of some of the best weather I’ve seen in months. Ogunquit Beach under pearlescent skies. There is still one spot open in the September 16-24 class. First person to pay the deposit gets it! I also added 2 slots for September 30-October 8. Terms of training have changed, based on results I’ve seen this year. You can train on a school motor for up to 15 flights, but after that you have to buy your own motor. However, you can now come back at any time within a year of your start date for additional training. This flexibility has been added to accommodate those with demanding jobs who can’t take a whole 9 days off, and for people who need extra time learning. 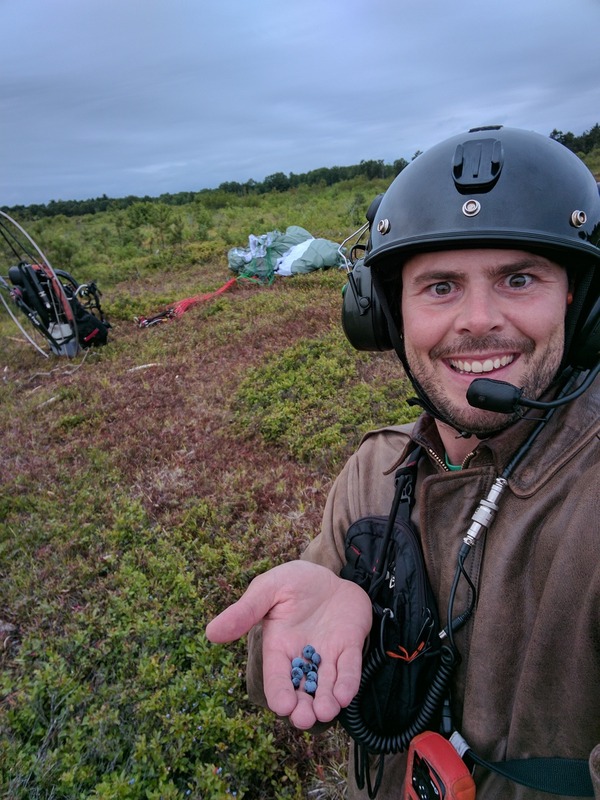 Raiding a Blueberry Patch from the Sky! The blueberries were ripe, and there were hundreds of acres of them. I was hungry and a little thirsty. I figured “I’ve had a lot of good flying today. I have a satellite communication device for if I can’t re-launch. 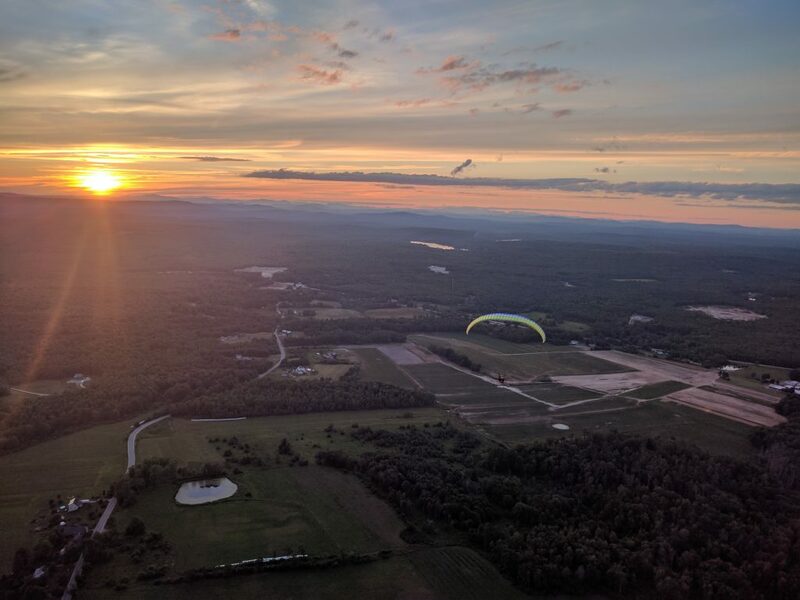 Why not do what I’ve always dreamed of doing?” I think every paramotor pilot occasionally dreams of dropping into a tight spot, doing some commando-style raid, then flying back out. 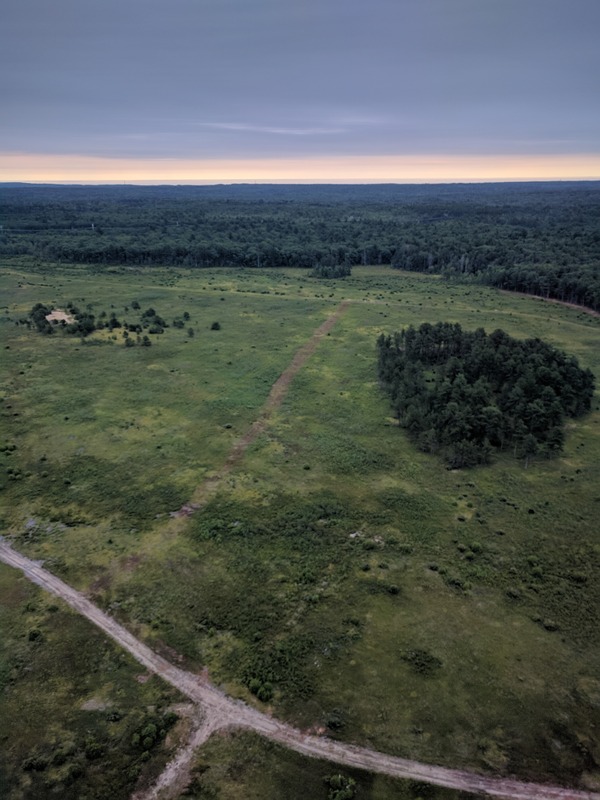 I dropped low into the clearing of the Wells Barrens Preserve to survey my landing options. 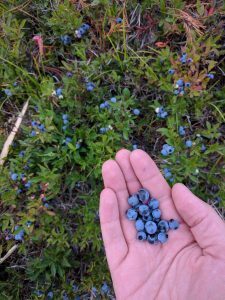 Blueberry bushes were everywhere, and running through those would be difficult, with a high likelihood of tripping me. I found a recent cut through the bushes, but roots and stumps were protruding along the cut, and the ground wasn’t very flat. I weighed the risk versus the reward of landing and re-launching. I decided to line up for a landing along the cut, roughly into the wind. Upon touching down, I discovered the approximately five mile-per-hour breeze 30 feet above was non-existent on the ground. I ran off my excess speed, vaulting over a deep rut. I knew re-launching would be difficult, but I was in pretty good shape, so as long as I didn’t trip on a root, stump, bush or rut, I’d make it back up. I balled up my wing and unclipped it from my Air Conception Nitro 200. I walked the motor over to a flatter part of the LZ-cut and set it down. I’m so happy a motor that lifts someone of my weight itself weighs only a touch over 40 pounds! I was born in the generation that these things exist! Missions like this one were the reason I wanted a lighter motor in the first place. Blueberries were everywhere. I think sometimes there were more berries on a bush than leaves. I ate my fill, raking the bushes with my fingers and shoving handfuls in my mouth at a time. It was a lonely feeling to be in the middle of the barrens with a grey overcast sky casting flat, shadow-less light on everything. My motor and wing were were my only instant connection to the rest of the world. In minutes– assuming launch went well– I would be back at the farm with my friends, flying circles above the grass and chatting on radio about how awesome my day was. I spread the wing across the cut, carefully keeping the lines from tangling in the bushes. I had just enough space to lay out the 20m Dudek Hadron. Ahead of me, I had about 30 feet of reasonably flat trail. I donned the motor, and clipped into my wing for a forward-facing launch in nil wind. There was no time for hesitation during the launch. I revved up the prop and blasted some air over the wing for a couple of seconds– a nill-wind launch trick I learned from my instructor and his instructor years ago. Then I ran forward, hard. The wing quickly shot through the prop wake and arrived above my head. Rather than checking the wing with my brakes to prevent overflight (the reasonable thing to do, by the way), I juiced the throttle and ran even harder. Guiding my run away from the bushes on either side, I took 5 steps over the rutted terrain and lifted skyward. The adrenaline high made me whoop a little at 50 feet. I probably terrified a bear or two. I circled back to take a photo of my LZ, then headed for home. Crossing ME-99, I heard Johnson on the radio. He and Kris had just arrived at the farm, and were getting ready to launch. I arrived just in time to see them take off. I spend another hour and half chasing Kris and Johnson, and landed 15 minutes after sunset, strobe flashing, with one liter of fuel left. Next time I’ll bring a bag for the berries. As described in my past post, here is the edited result from flying with my chase cam. Get in touch if you’d like to build one yourself- they are really simple. As a side note, I got some vertigo from editing the footage from the camera. The camera is held upside down in the chase rig, so I have to flip the video in production. Also, the chase cam is constantly swaying back and forth, so the video has a somewhat nauseating quality to it. Best not to make a whole 3-minute youtube video of exclusively chasecam footage.